My trip to Israel and the Jerusalem Marathon registration were paid for by the Israel Ministry of Tourism. All opinions and race experiences are my own. Please see my Disclosure Policy for more information. So when I received the itinerary for my press trip to Israel, one of the first things I did (okay, THE first thing I did) was Google everyone who would be on the trip with me. 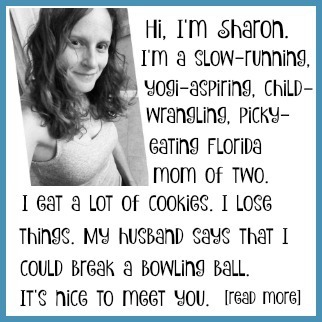 There was Beth – Boston marathoner, Ironman, and the voice behind the hugely popular running blog, Shut Up + Run. 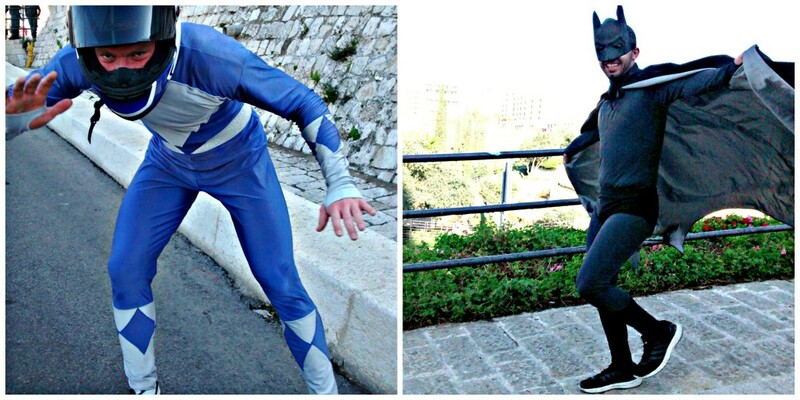 Dax – the ultra-ultrarunner and trail runner who’d trained for the Jerusalem Marathon in 6 weeks. Adam – Ironman, ultrarunner, sponsored athlete, and president of the American Trail Running Association. I panicked a little. Had there been some kind of mistake? Did the Israel Ministry of Tourism get me confused with some other (faster) mommy running blogger? Did they realize that I’d just barely broken 2:30 in a half marathon? But there was lots to do to get ready for my trip, so I set my worries aside. I’d been chatting online with some of the girls with whom I’d be traveling, and everyone seemed so nice. Plus we all seemed to be under-trained for the race – not surprising, considering we’d only had about 5-6 weeks to prepare. So maybe that common thread would level things out a bit. After some sightseeing and a power nap at the hotel, I met up with Teresa. We went for a walk, grabbed some falafel, and chatted about blogging, traveling, and (of course) running. We talked about our lack of training for this race and the many, many rolling hills that we’d seen on our drive from Tel Aviv to Jerusalem. Teresa, who was running the full marathon, was particularly worried about the hills and predicted a super slow race with a finish time of 5:00. Pretty big difference from her sub-4 marathon PR. Gulp. Should I tell her that my marathon PR is 5:31? 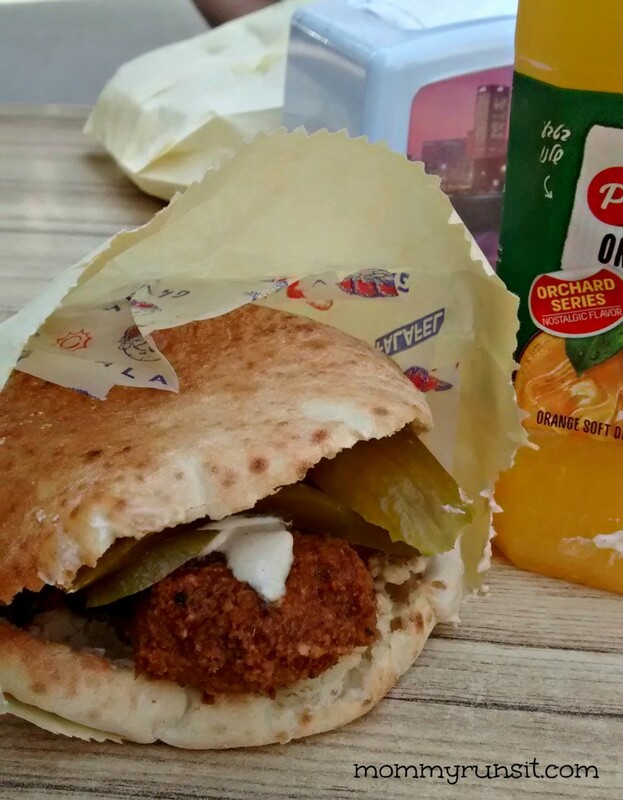 Still, I had taken a huge leap of faith by traveling to Israel. My first international flight, my first time leaving my kids and my husband for more than a 3 days, my first press trip. I wasn’t going to let my ego spoil this trip for me. Thank goodness, because a couple of days later, we were all on the bus, and I overheard Ginger say that she’d run the the Jeff Galloway 13.1. Actually, she’d run-walked it. And guess what – she wasn’t the only run-walker on the bus! Lorraine, Kim, and Suzanne all used some variation of run-walk intervals. And like me, all of them had an average half marathon time of around 2:20-2:30. I’d found my tribe! Ginger was running the 5K, but Lorraine and I made plans to run the half marathon together with 2:1 run-walk intervals. We also agreed to take our time and enjoy the run, without setting a time goal. That was such a relief (and also a bit of a fangirl moment for me, since Lorraine’s blog, Run, Wifey, Run, was the very first running blog that I ever followed). This year, approximately 25,000 people representing 60+ countries ran one of these distances, including Nir Barkat, the Mayor of Jerusalem (he ran the half marathon). The most popular distances are the 5K and the 10K. About 3,000 of us ran the half marathon, and about 1,500 ran the full. In addition, about 6,000 people ran in support of a favorite charity or cause, and many ran in memory of fallen IDF soldiers. The race event included an impressive expo and a pasta dinner (free for marathon runners) on the eve of the race. 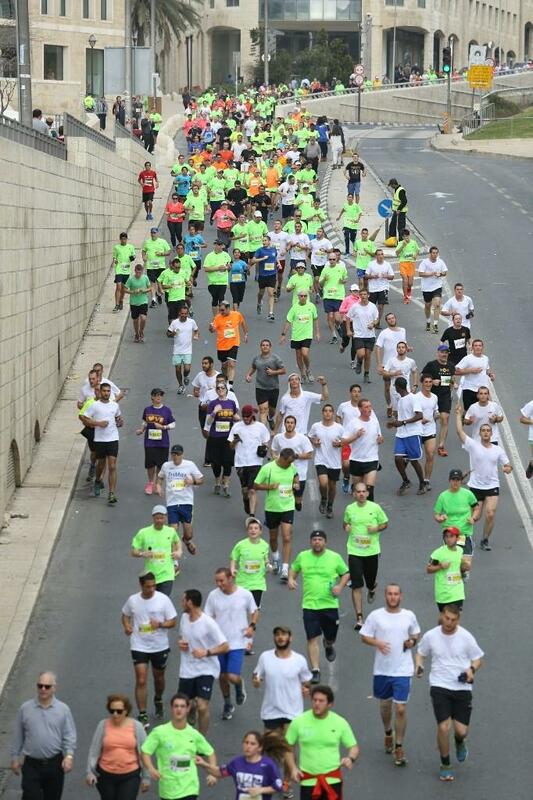 Of note – unlike most races in the US, the Jerusalem Marathon is on a Friday. This is because the city basically shuts down for the Jewish Sabbath, which begins Friday at sundown and lasts until Saturday night. Mayor Barkat described the race course as having a “unique topography.” This, as Teresa and I discovered in our first few hours in Jerusalem, was a fancy way of saying Lots Of Hills. The hills were challenging for all of my traveling companions – especially those of us who are used to running on flat terrain. My hometown (Jacksonville) has bridges, but most of our race courses include 1-2 bridges, tops. Some of our bridges are steep, but the mindset is different. With a bridge, you know it’s coming – you can see it far up ahead – and you just have to make your way to the top. But with rolling hills, you’re always running uphill or downhill, and you’re never quite sure when the next hill is coming – or how steep it’ll be. Don’t get too rigidly locked into a specific ratio of walk breaks, adjust as needed. Even if you run the same distance every day, you’ll find that you’ll need to vary the walk break frequency to adjust for speed, hills, heat, humidity, time off from training, etc. If you anticipate that your run will be more difficult or will produce a longer recovery, take more frequent walk breaks (or longer walks) and you may be surprised at how quickly you recover. It’s even more breathtaking in person. 13.1 miles of scenery, culture, history…it’s SO worth it. 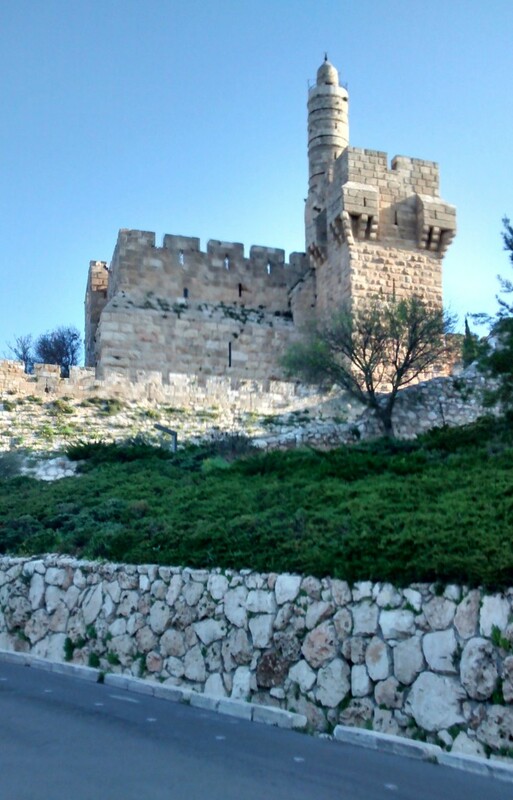 We ran alongside the Tower of David, through ancient cobblestone streets in the Old City, across Talpiot’s Haas Promenade, and past the Knesset (Israel’s parliament). There were 7 water stops on the half marathon course. The course is marked in kilometers so I can’t tell you the exact frequency, but I would say that there was one about every two miles. In my experience, this is a little less than average for the typical half marathon, but it was sufficient. Three of the water stops also had “isotonic drink.” I’d read mixed reviews about this prior to the race, but I thought it tasted fine – like a less sweet version of Gatorade. One significant difference about water stops in this marathon vs. races in the US – instead of small paper or plastic cups, volunteers hand out small plastic water bottles with the top removed. (This was my first non-US race, so I don’t know if this is common practice in other parts of the world.) I didn’t really care for this – the water bottles were harder to drink from (while running/walking) than cups. 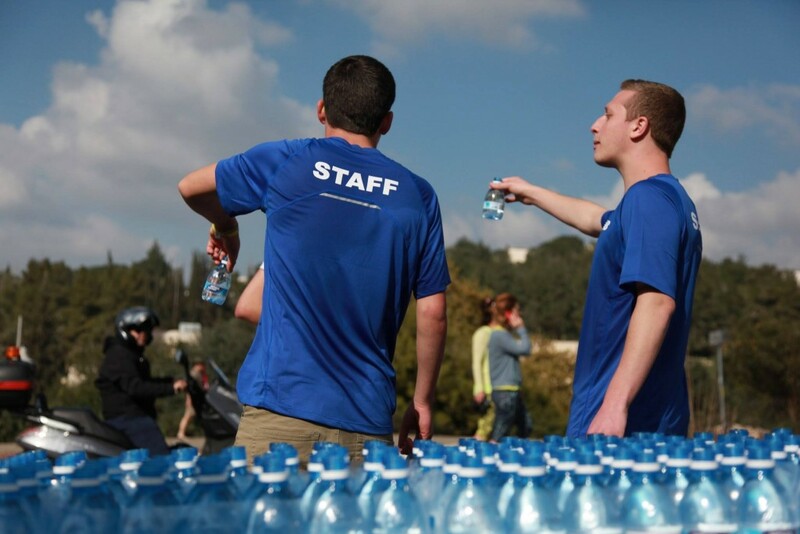 Also, since most runners only take a sip or two of water, the bottles provided much more water than necessary. This means that when the bottles were discarded, lots of water spilled onto the road. Running through puddles makes me grouchy. Also, it gave some of the more “youthful” runners an opportunity to throw water on each other (and anyone nearby), which also made me grouchy. And since I’m grouchy just thinking about it, I’ll point out that a semi-full water bottle carelessly tossed to the side of the road could easily hit an unsuspecting runner in the shin, which would hurt. Fortunately, I had my own handheld water bottle, so I was able to bypass some of the water stops and not be a grouchy old lady. According to the race map, one of the water stops also had energy gel, but I wasn’t really looking for it since I’d brought my own. There was also a food stop, which I thought was pretty awesome. I can’t remember exactly what was there, but there were several options, including orange slices and pretzels. (I had pretzels.) The full marathon runners also had hummus and coffee! Man, does the Jerusalem Marathon get this right. Tons of locals were out cheering us on, including lots of families and little kids with outstretched arms, waiting for high fives. There was musical entertainment throughout the course – musicians of every variety. And my favorite part – the costumed entertainers cheering and dancing in the street. According to the course map, there were 4 bathroom stops on the half marathon course and 5 on the full marathon course. I didn’t notice them because I didn’t need to use them. I did use a porta-potty at the starting line, and it was fine. Oh! And while we were lining up to race, Kim pointed out a line of men with their backs turned to us heeding nature’s call. No trek into the woods for these guys – they were right in plain sight. I’d planned to run the race in a short running skirt, but since it was colder than I’d anticipated on race day, I ended up wearing pants and a long sleeve top (borrowed from Heather). I was glad for this last minute change because the only running skirts that I saw were on my American friends, and I think I would’ve felt uncomfortable showing so much skin. I did see some women wearing long (below the knee) skirts with leggings – presumably, these were religious women who were dressed for modesty. Ironically, the men didn’t seem to adhere to the same standards of modesty. Many of them were wearing the shortest running shorts that I’ve ever seen. The runner’s kit was pretty no-frills – a New Balance tech shirt and some vouchers/coupons. I don’t know what they were for since most of them were written in Hebrew. (I should point out that this was not the norm – nearly everything associated with the race was written in English.) I love the race shirt – it fits really well, unlike most of the tech shirts that I’ve received from other races. Another cool thing – before the race, there was a tent set up with deeply discounted race gear. 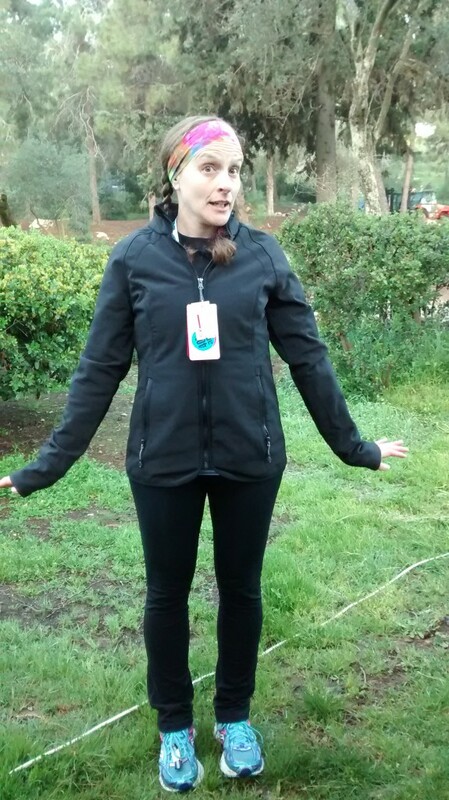 I got this awesome jacket for 100 shekels, which equals about $25. I saw people walking, especially during the last 3-4 miles. But besides Lorraine and me, I didn’t spot anyone else who seemed to be doing official run-walk intervals. (Kim was run-walking too, but at a faster pace). I’m used to running with my Galloway friends and/or in Galloway-friendly events, so this was a little unusual for me. No beeping Gymbosses, no pace group leaders shouting instructions, no hands raised up ahead to warn of pending slowdowns. We stood out a little, but I never felt awkward or that I belonged there any less than the other runners. I’m not a fast runner, but I’m typically not at the back of the pack either. But with this particular race, I was way in the back. Like “afraid the sweepers were coming for me” back. Granted, I ran this race at a considerably slower pace than my previous half marathons, but if you take into account my lack of training, the hills, and all the stops we made to take photos, a 2:55:02 finish isn’t unexpected. 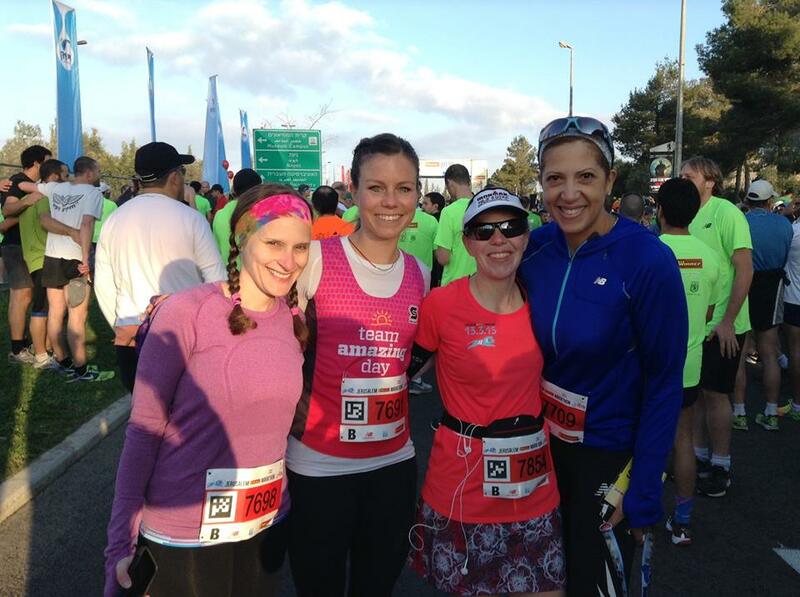 But when I compare the results of the Jerusalem Marathon and the 26.2 with Donna, a couple of things stand out. 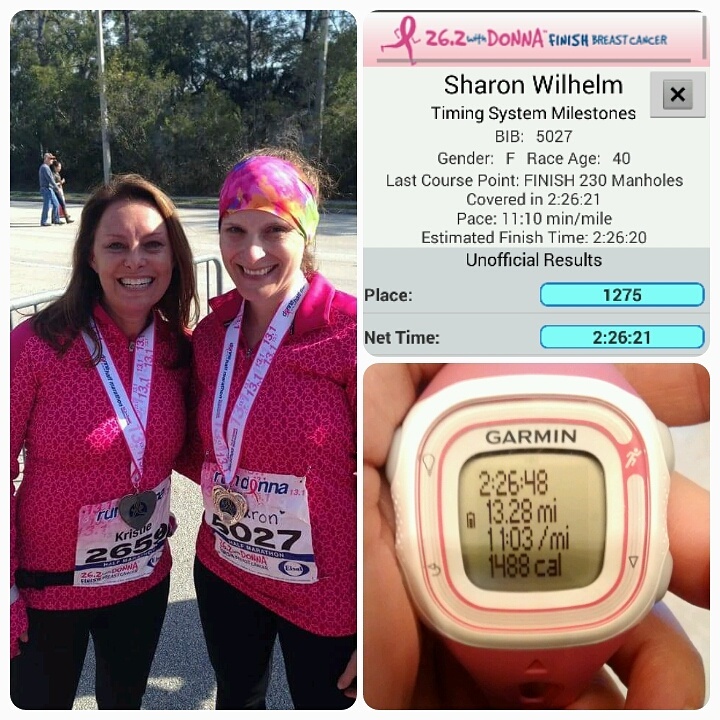 Both races had almost the same number of half marathon finishers – 3376 (DONNA) and 3301 (JEM). At the Donna, I placed 1267 overall, which puts me in the top 40% of finishers. I’m no speedster, but I wasn’t anywhere near the back of the pack in that race. On the other hand, in Jerusalem, I placed 3173 overall, which puts me in the bottom 10% of finishers. Only 128 runners crossed the finish line after I did. Now that’s back of the pack. To take it a step further, we can compare my finish times. I finished the Donna in 2:26:21. 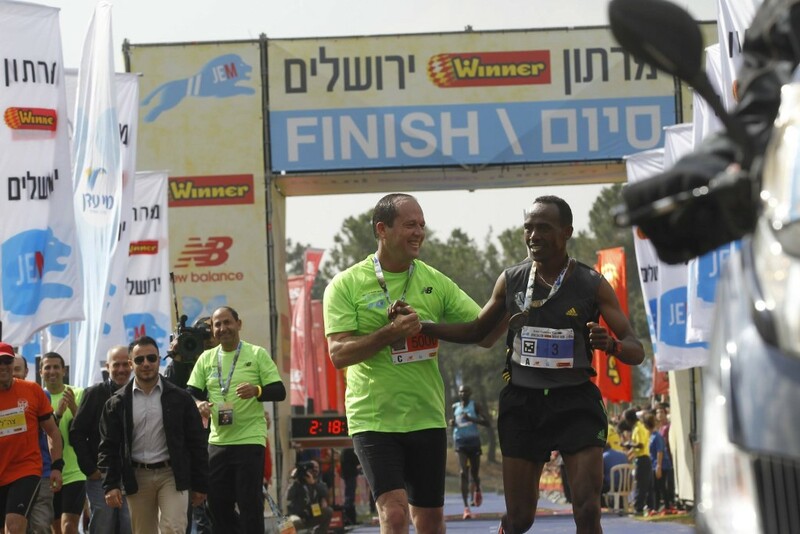 In the Jerusalem half marathon, the runner who finished in 2:26:23 placed 2748 overall, which still falls into the bottom 20% of JEM finishers. Even if I’d run my usual pace, I still would’ve finished in the back of the pack. Conversely, I finished Jerusalem in 2:55:02. One runner who finished the Donna in 2:55:13 placed 2127 overall which, believe it or not, is still well within the middle third of finishers – not even close to the back of the pack, with over 1200 racers yet to cross the finish line behind her. My point? 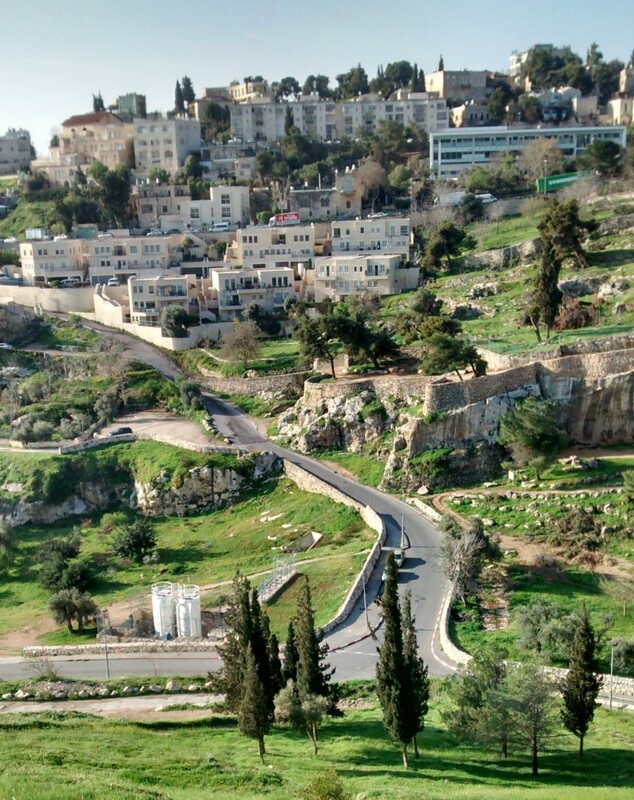 The Jerusalem Marathon (half or full) is not for novice runners. If you’re a casual runner who thinks it would be fun to run a half marathon, this is probably not the ideal first race for you. This is a very challenging course, and most of the people who run it are experienced, fast, and well-trained. This is not to say that the Jerusalem Marathon is not for run-walkers, slow runners, new runners, or back-of-the-packers, because it is! But if you want to enjoy this race, you MUST train for it. Don’t wing it. Your calves will disown you, and your quads will rebel. Train enough so that you can enjoy all of the wonderful sights and sounds. I want to point out that even though I was one of the last people to finish this race, I never felt less than. Back-of-the-packers sometimes find themselves running those last few miles without crowd support, water, post-race food, or even medals. None of those things were true for me. Some of that was probably because the half and full marathon courses converged in some places. It doesn’t matter though. The musicians still played for us. 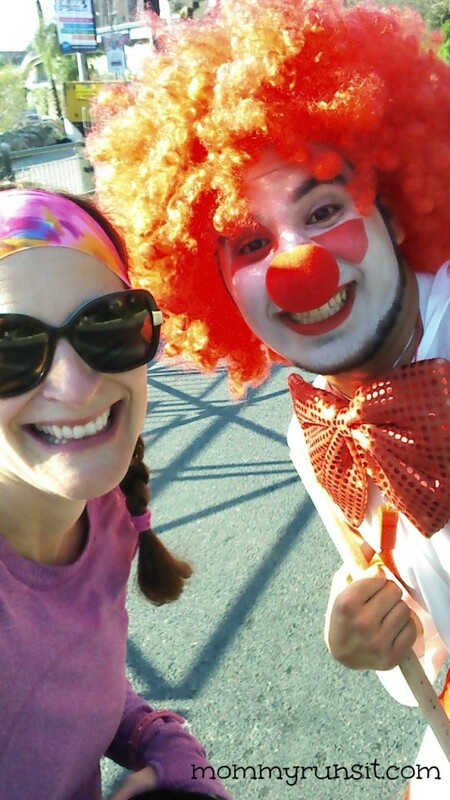 The entertainers, spectators, and volunteers still cheered for us. There was still plenty of water and food, both during and after the race. And the race announcer still said my name as I crossed the finish line in 3173rd place. 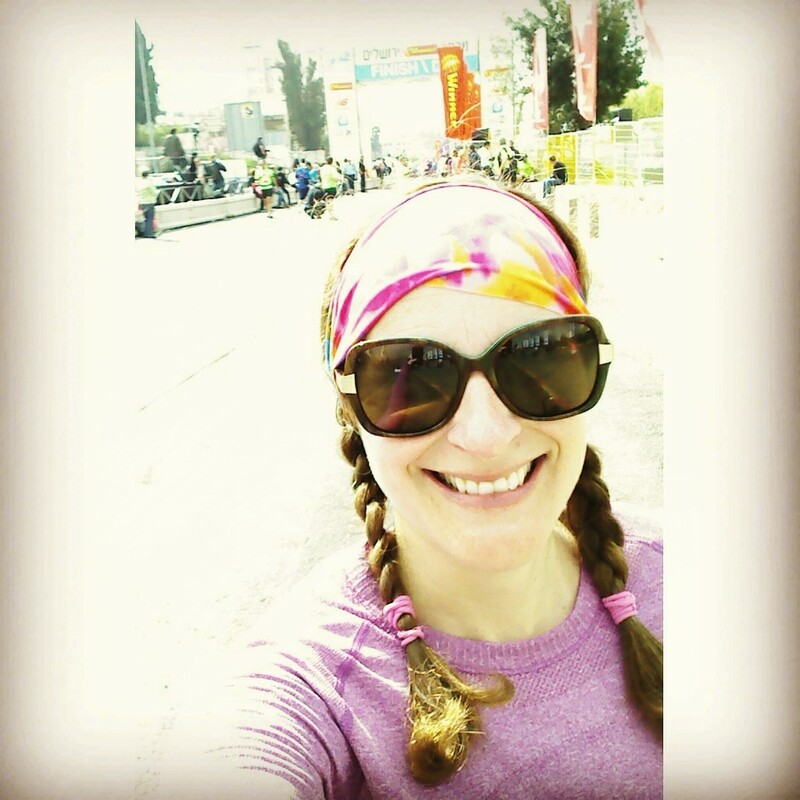 Would I run in the Jerusalem Marathon again? ABSOLUTELY! This race and the press trip that went along with it was one of the most incredible experiences in my life, and I’d do it again in a heartbeat. Only next time I’d train more…and Google less. p.s. 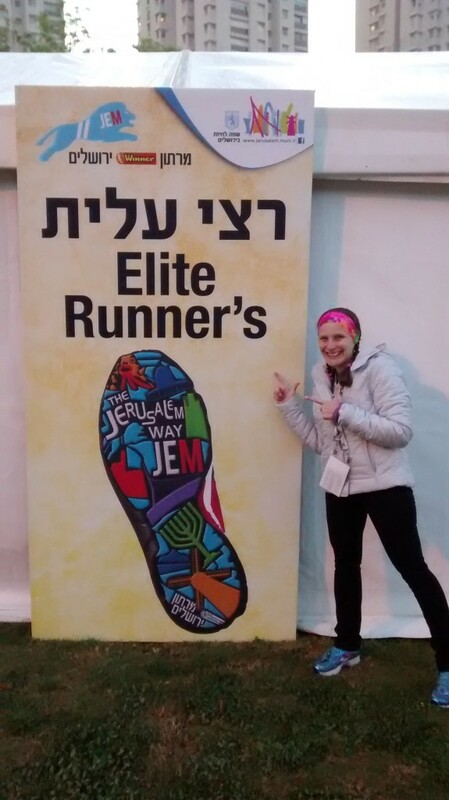 My traveling companions have written some great recaps of the Jerusalem Marathon – each of them offers a unique voice and perspective. 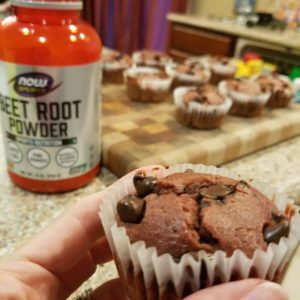 Check them out – they rock! Really interesting to read about international races and to see the differences like the water bottles offered. Congrats on your finish! Looks like an amazing experience! I wish I could have gone (it would have been my first press trip too!) but it just couldn’t work out. It’s great to hear that it was a well supported race, you look like you had a blast. Your pictures are beautiful! This is an amazing story and it’s fantastic you got to travel to Israel to race. Congrats! In the UK, small/local races will often use plastic cups for water out on the course, but larger events will usually have water bottles or water pouches. I prefer pouches as they are easy to carry whilst running. If I have a cup I usually end up spilling it all over myself! I think races here must be more competitive. I’m considered to be quite a slow runner, but my HM PR (or PB to me!) is 1:52:19, with most of my HMs being completed in about 2 hours. The most popular local half marathon had 1574 finishers. The runner in 1570th place did it in 2:55:33. At one of the UK’s largest half marathons, Reading Half, that time would have placed you at about 13000/ 13338 runners. I’m not saying this to be rude; it’s interesting how running is perceived in different countries. Slower runners are welcome at 5k events, but they tend not to enter longer events here. Likewise, I’ve read about the Galloway Method before, but it’s not something that people tend to follow in the UK (unless they haven’t been able to train enough for a race or are injured). There tends to be an attitude that if you’re going to do a race, you ought to be able to run the entire distance without hvaing any walking breaks. 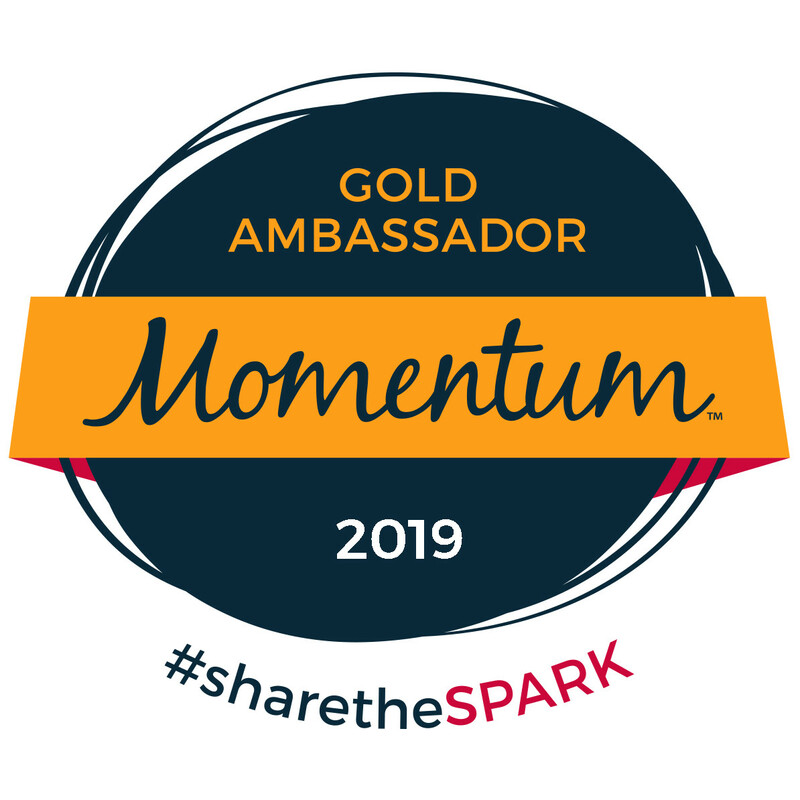 I like the fact that more people are encouraged to take part in events in USA and that events are welcoming to people of a wider range of abilities. That’s so interesting! I’ve only been running for about 3 years, and almost all of my training has been with a Galloway program. We have quite a large group of runners in my hometown – I’d say several hundred people come out for one of the programs each year. The race I mentioned above (the 26.2 with Donna) is a fundraising event, so all are encouraged to participate. It’s a Boston Qualifier, so there are lots of elite and competitive runners, but it’s also a very fun community event that’s very walker friendly. Actually, Jeff Galloway is one of the race founders. I still get some raised eyebrows when I discuss run-walking. Even some of the people on the Israel trip with me were not fans. I love the concept, but I’m considering exploring some other training programs. How cool was that! There is nothing like getting to see new places and running at the same time. Such a brilliant experience. Where are you off to next? I still can’t believe it happened to me. 🙂 Believe it or not, I’m traveling to Israel again this summer for a totally unrelated adventure. Not sure how much running I’ll get to do while I’m there, but I can’t wait to go back!